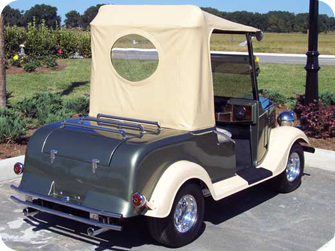 Golfing classic style and buggy on down to the 1930's! 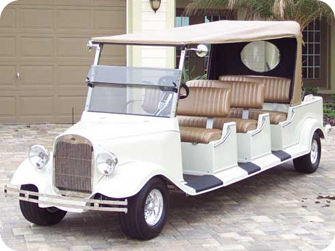 Classic Golf Buggies are a exquisite addition to any Hotel, Golf course or privately owned estate. Built with only the highest quality materials and using outstanding craftsmanship. 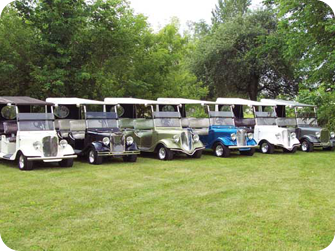 All these buggies come with a 3 year warranty from Club Car. 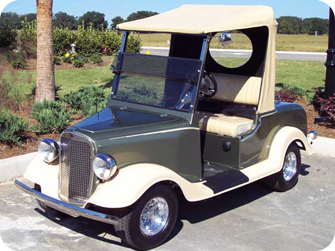 Club Car is the leading manufacturer in golfing buggies. 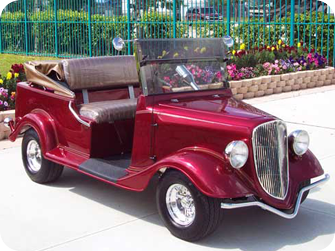 These Classic Golf Buggies originate from the USA and were inspired by the classic car of the 1930´s. 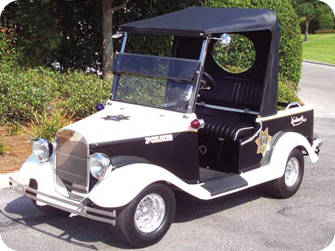 There are 3 different models to choose from based on the 1935 Chevy, the 1934 Ford and the 1929 model A Ford. 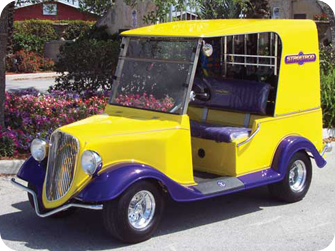 All models are custom designed to your own specific requirements making them unique to any other golf buggy. Standard features include cd/cassette player with am/fm radio, front and tail lights, break light and an integrated drinks cooler which holds up to 36 cans. Customers can also benefit from extra features such as LED ground effects, choice of seat fabric, side curtains and carpets. Available for commercial use is the 2 passenger Beverage & Snack cart which offers storage for up to 200 cans, 64 snacks + 6 liquor bottles. Also available for corporate events is the prestigious 6 or 8 passenger stretch style limousine cart allowing a 5 star service for VIP guests. All hardware - Stainless steel. Base coat, clear coat paint. Choice seat cushion fabric (Cloth or naugha-hyde). Original Club Car glove box. Working hood with insulated coller compartment (36 can capacity). Under seat storage tray (electric buggy only). 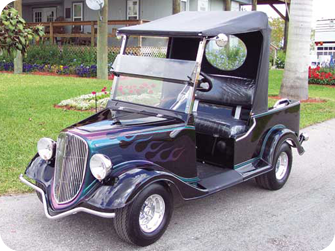 Click on the player to start the introduction video about this amaizing golf buggy.